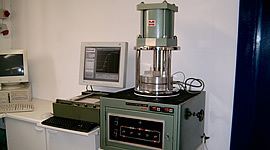 Our refurbished Monsanto R100 Oscillating Disc rheometer is utilised to provide routine Rubber cure rheometry measurements for contract testing, (for cure of other materials such as Thermosetting Plastics, Epoxies, Isocyanate adhesives, Polyurethanes, etc, see Rotational Rheometry). The temperature control system of the machine has been completely replaced with digital temperature controllers / Platinum resistance thermometers giving temperaure control to ±0.1°C. 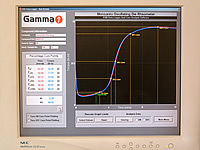 Data is collected by a bespoke Gammadot data logger software system enabling swift analysis & comparison of data sets. Test procedures are in general accordance of the British standard: BS 903-A60.2 (ISO 3417). Gammadot is also able to provide in-depth compound investigations utilisng an Alpha Technologies RPA2000 Rubber Process Analyzer which is available to us on a hire basis. 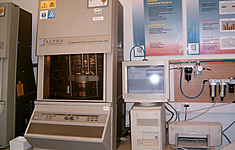 The RPA2000 has the facility to vary both the strain & frequency applied to the rubber sample enabling the generation of comprehensive rheological information in both the pre- & post-cure state.